Who Watches? Who Cares? 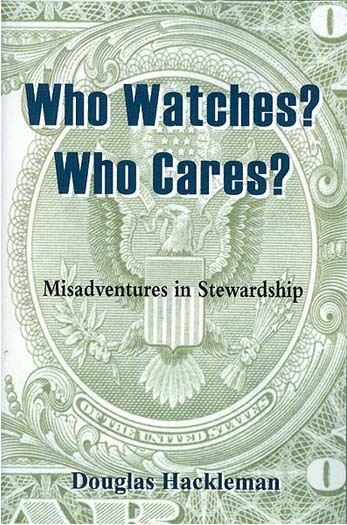 Misadvendures in Stewardship (MCA, May 2008), 379 pp. $19.95 plus tax, postage. Readers are taken inside seven informative cases of corporate church administrative failure that resulted (between 1978 and 2000) in the catastrophic loss of institutions, members and scores of millions of dollars. The following cases are documented by 1,184 end notes. Nineteen graphs and tables, and a name index, augment the narrative. The power of these unusually readable and heavily sourced stories to prevent future such misadventures depends entirely on how many involved church-loving members, pastors and admini-strators will internalize the lessons they teach. . . . . because these disasters were not due to flood, fire or earthquake (acts of God), they were not beyond our collective control. We the church members, acting as enablers, are by no means blameless--giving and giving of our means without requiring accountability. The intention of MCA . . . with this publication is to motivate every Adventist not only to watch and to care, but to agitate for those adjustments to policy, oversight and transparency that will preclude the need for a sequel to this publication (p. 374). About Who Watches? Who Cares? The book is a very good read . . . brightened by precise language and penetrating insights. Some people may think that reference to me and Andreasen in the string of comments regarding Hackleman's splendid book is quite a stretch! MOUSE CLICK ON BOOK TO READ A CHAPTER.